Whenever India plays any match, their supporters normally pin a majority of their hopes on the batting to do well. ‘Aaj Sachin khel raha hai?’, ‘Viru ko sirf maarna hi aata hai, aur kuch nahi’, ‘Yuvi Test match mein kabhi nahi khelta’ are some of the passionate trademark dialogues of Indian fans over the years. But the reason for it is because of India’s long batting line up which can scare even the best team in the world on a given day even before the match starts. The days in which Rahul Dravid, Sachin Tendulkar, VVS Laxman and Sourav Ganguly were present, India managed to beat Australia on a more regular basis than before. No wonder why they were called the ‘Fab Four’! However come to think of it, the main reason why India has not been a long term world No.1 in all formats of the game is because of their fast bowlers letting the team down more often than not. It is said infamously that for an opposition batsman to get his form back, make him play against India! Rare is the scenario when the quicks perform well and the batting fails for India. This is why teams like Australia and South Africa have managed to win on a more consistent basis and are on the top of the cricketing world even today as their focus is to play quality cricket with each player’s role in the team being very important. 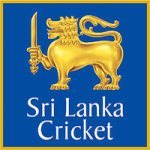 They do not rely on just their batting or just their bowling to do the job for them and for instance if the batting was poor on a given day, the bowlers made sure that by hook or crook they stepped up for the team and vice a versa. 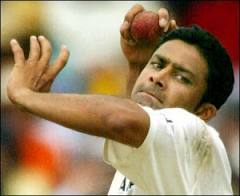 Bowlers such as Glenn McGrath, Brett Lee, Shaun Pollock, and Allan Donald could make it in one’s list of all time fast bowling greats and no Indian pacer barring Kapil Dev would make it to the list. But lets take our arch rivals Pakistan for example. It is said that any player who aspires to make it big in no time for Pakistan has to bowl with tremendous pace! Hence in any form of cricket, anyone would like to bowl rather than bat there but in India, it is the very opposite. This is why Pakistan has produced superb pacers more than quality batsmen over the years such as Imran Khan, Sarfraz Ahmed, Wasim Akram, Waqar Younis and Shoaib Akhtar. 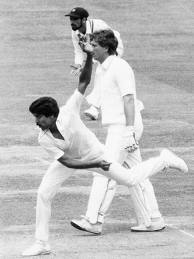 While West Indies adopted a strategy of bowling aggressively with pace irrespective of the conditions after the humiliating 1-5 Test series loss in Australia in 1975, and thus it was the then captain Clive Lloyd who sowed the seeds of the country’s glory in the 80s and a part of the 90s as pacers such as Michael Holding, Andy Roberts, Malcolm Marshall, Courtney Walsh and Curtly Ambrose have thrived playing in such a culture. So it’s the attitude towards pace bowling in a country which also matters to a huge extent. India on the other hand, have always relied on spin or slow bowlers. In the 1950s, on tours to England where the weather is unpredictable and the pitches are unfavourable, still the Indian team would be packed with spinners, with hardly any fast bowlers! This might have to do with the fact that since the beginning, most pitches in the country are suited either for spinners to thrive on or batsmen to score a lot of runs on. The playgrounds in India are uneven as well, so when a youngster tries to bowl quickly, he has to be very careful as he might suffer from a career threatening injury. So India has been able to produce not only great batsmen but great spinners as well such as Anil Kumble, Harbhajan Singh, Erappalli Prasanna, Subhash Gupte, and Bishen Singh Bedi and so on. What the Indian administrators however have failed to realize I think is that it is not only spinners which win you a game, fast bowlers are equally important to pick 20 wickets in a Test match or 10 wickets in a one day game. It might be a reason why India has just won only 116 Test matches till date, while our ODI record can be so much better! Thankfully India had Kapil Dev, who might have been the pioneer in promoting fast bowling in our country with his stellar performances in the 70s and 80s. Another reason why India does not have a dearth of pacers could be because of the traditional Indian diet and the body structure of the normal Indian. Most Indians since childhood, are told by their parents to be a vegetarian throughout life mainly because it’s a part of our culture over the years and children tend to follow this without logic. Of course it is very good to be vegetarian, but for pace bowlers apparently it is not. To bowl fast, a person needs to have the adequate amount of energy for it and that comes from more calories which a vegetarian diet may not provide. They are losing out an important source of protein through meat and it is well known that red meat is vital in increasing the arm strength, which can prompt a bowler to bowl much quicker. Many pace bowlers over the world have admitted that sufficient non vegetarian diet has really helped them (although Australia’s Peter Siddle would be an exception now!). And most Indians are not even tall in height. For a fast bowler, bounce is as important as pace to be more lethal and being tall is an added advantage for him. 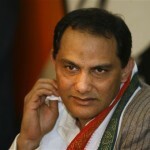 However, the tide seems to be changing in Indian cricket. In the last 4 years or so, Indian pacers have been contributing more than spinners at home rather than away from home! With the retirement of Anil Kumble and the poor form of Harbhajan Singh, quality spin seems to be on a decline in India even as Pragyan Ojha and Ravi Ashwin seem promising for now and fast bowlers are still prone to injuries. The IPL has also helped the selectors notice talented fast bowlers who might have not been recognized by their Ranji Trophy performances. Zaheer Khan, the spearhead of the Indian bowling attack over the years would not be there for long and for the moment, India might have to consider selecting amongst the pool of bowlers consisting of Irfan Pathan, Ishant Sharma, Ashok Dinda, Umesh Yadav, S Sreesanth, Bhuvneshwar Kumar, Parwinder Awana and Shami Ahmed for example. They all are talented and only need more encouragement from the BCCI for improving continuously and curators across India must strive to make pitches similar to those in Bangalore and Mohali which gives incentive for bowlers to bowl with a lot of pace. A combination of an excellent pace attack and the way in which the captain uses them could surely make India the No.1 team in the world again in all formats of the game.